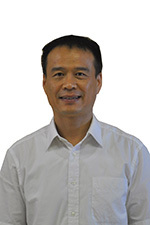 Mr Guangmin Wei is a Material Scientist Engineer with more than twenty (20) years’ experience. Mr Wei joined PMC from HBIS Duferco China where he held the position of the Chief Operations Officer (COO) responsible for manufacturing and processing. Prior to that, Mr Wei was the Vice-President for processing and manufacturing at Handan Steel Group. As a Vice-President for processing and manufacturing, Mr Wei’s was responsible for managing development and implementation of sales strategy and plans, management of technology leadership and quality control. Before then, he held several Directors positions at Handan Steel Group, including that of Human Resources, Director for Human Resources and Plate Mill consecutively. As a Mill Plant Director, Mr Wei was responsible for amongst others, managing simultaneous optimization of growth and profitability of complex plants which consisted of producing 500 000 tons of push-pull pickling, 300 000 tons line galvanising and 100 000 tons of colour coating strips per year. His experience in technology management includes developing and implementation of technology strategies and disciplines to create competitive benefits. As the specialist and leader that acquired experience in the upstream and downstream facets, Mr Wei’s experience embraces, strategic leadership and management, human and financial resources management, management of mill plants, processing, manufacturing, sales and technology management. Mr Guangmin Wei holds Bachelor and Master’s Degrees in Material Science and Engineering, both degrees acquired from the Science and Technology University of Beijing.